For many people, “traditional Greek” settings would mean earth-toned environs with surroundings hewn from stone and clay, brass and wood. Rough walls contrast with a peaceful atmosphere, evoking the old glory of this cradle of civilization. It is bold and raw, yet grounded and serene. Now, how about dining in such a location? 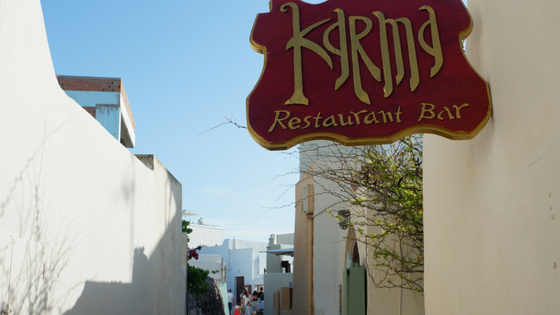 This is exactly what one finds in Karma, a bar and restaurant located in the Santorini town of Oia. It’s as if someone turned one of those Hollywood movie sets into an indulgent resto! The whole place is situated in one of the quieter parts of Oia, behind the clock tower. It makes for a romantic setting, complete with well-thought out lighting and music. 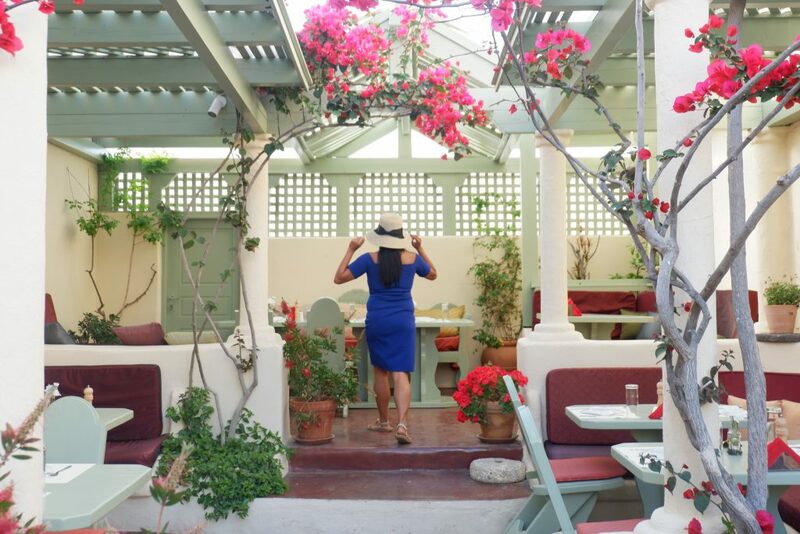 Aside from the tasteful interiors, the courtyard is also available to seat guests. 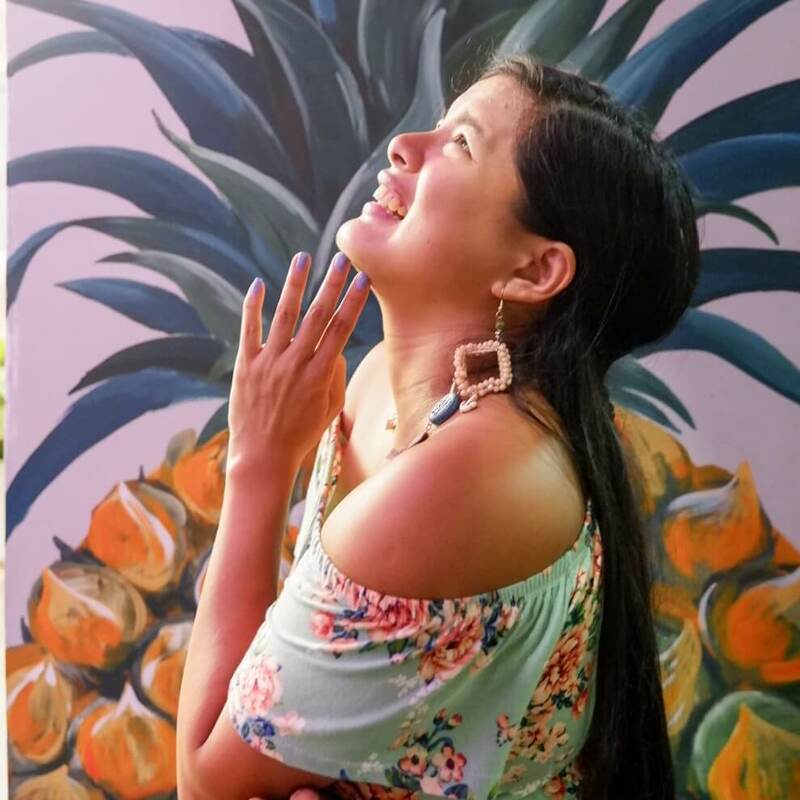 Sure, it doesn’t have mountains or seas around to sweeten the view, but you won’t get tired from looking around the great ambience the restaurant itself makes. But while Karma itself has the looks of a tourist attraction, one does not go to a restaurant for the sights. How does the food fare? According to the owners of the place, they have journeyed around the world to sample the different cuisines. 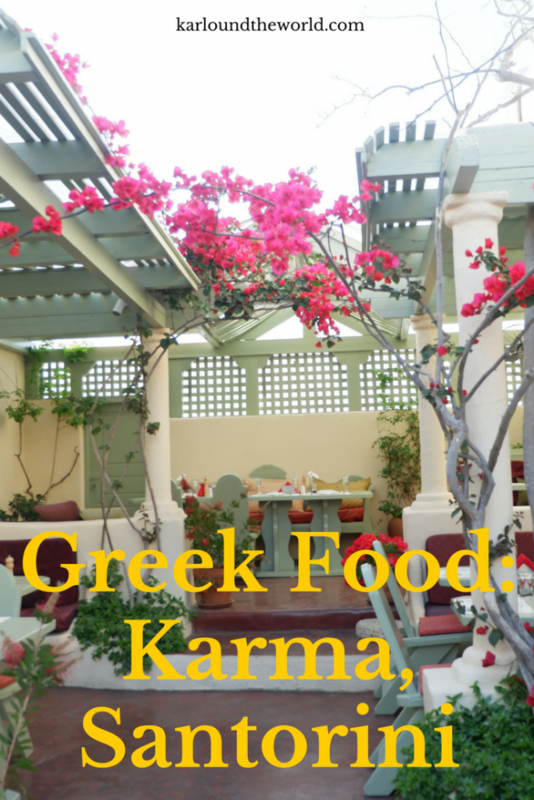 They established Karma when they returned, choosing to showcase Greek cuisine using recipes coming from around the Aegean. With that kind of résumé, you would think that the restaurant’s kitchen cooks up tastes on par with the world’s best. Karma does not disappoint. First, we had Fried Feta with Honey and Sesame Seeds. It was a wonderful melding of sweet and salty! The feta was juicy, which was also well-complemented by the crunchy texture of sesame seeds. The honey sauce coats everything in a smooth texture. The meal costs 8.70 EUR. Up next were mini pies with minced beef and apple chutney. This costs 10.70 EUR, and has the same delicious combination of sweet and savory. It was a charming appetizer, even more so since you know it’s all home-made and not some commercial preparation. Along the way, we also had some Mavrotragano red wine. 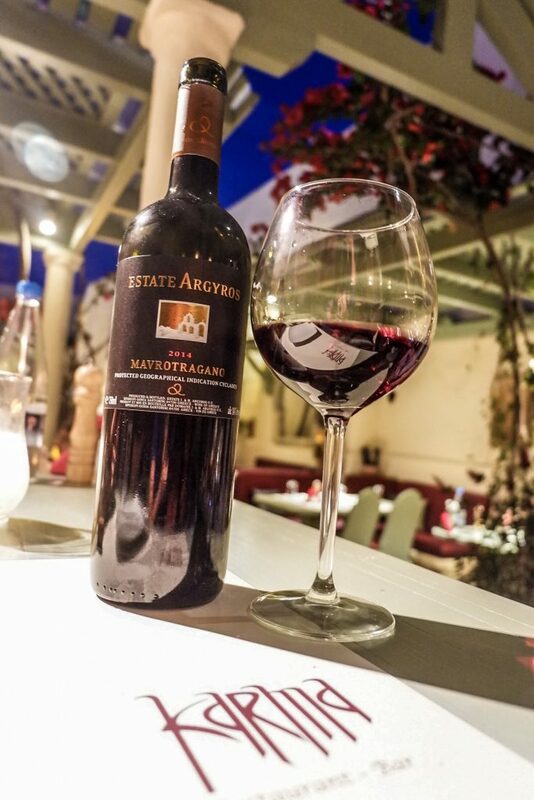 The carafe quickly ran out, a testament to the unique taste of this Santorini wine. This was my favorite from our previous tour, wine tasting with Selene. This was quickly followed up by another appetizer, Fava with Caramelized Onions. Santorini is known for producing some of the best yellow split peas in the world, and this dish showcases that. 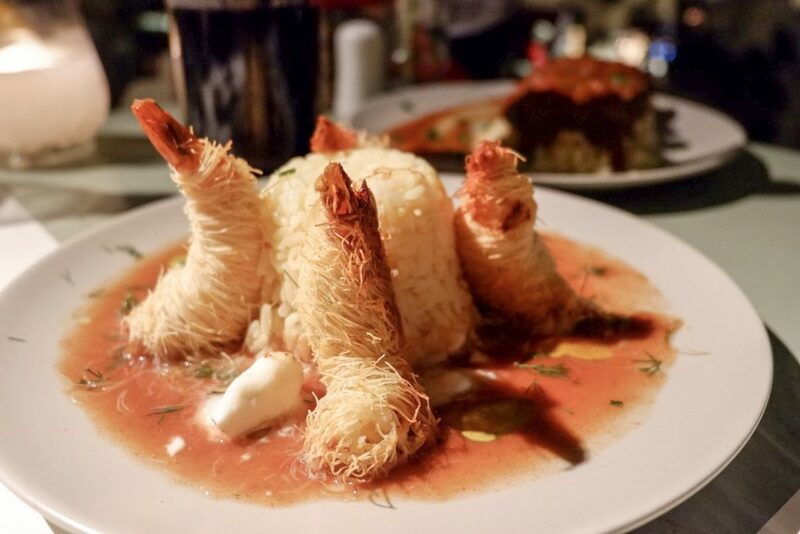 For the main course, we had a Soutzoukakia served with Yellow Rice (14.60 EUR). The rice was cooked in onion broth. 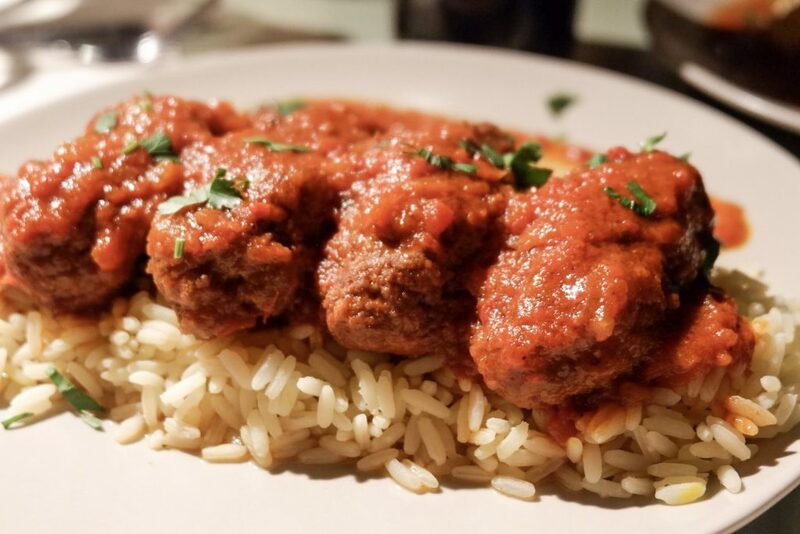 There were little ground meat kebabs slathered with tomato sauce, herbs, and red wine! We were told this food was considered an aphrodisiac, and it was really delicious. Finally, we had some dessert — Honey Baklava with Mastiha Ice Cream! It was a heavenly blend of sweet, tangy, citrusy, and nutty. 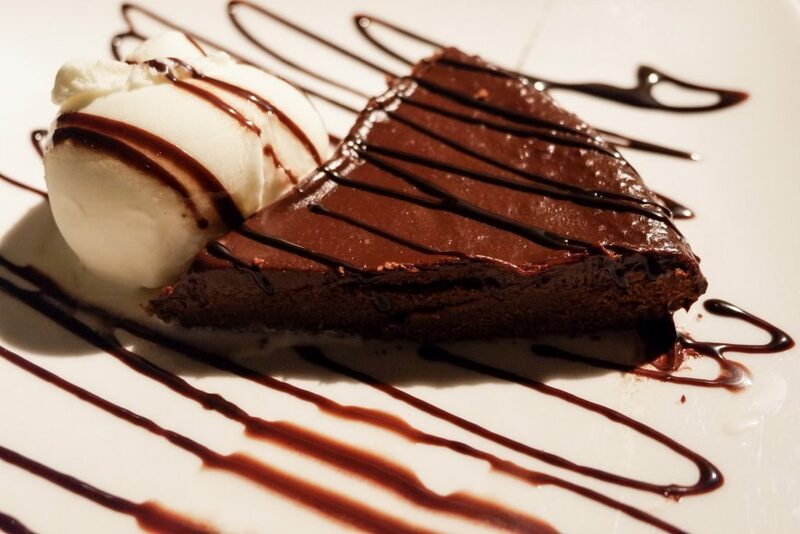 We also had some Chocolate Pie with Vanilla Ice Cream, for 7.60 EUR. It was a delectable end to this little gastronomic journey. 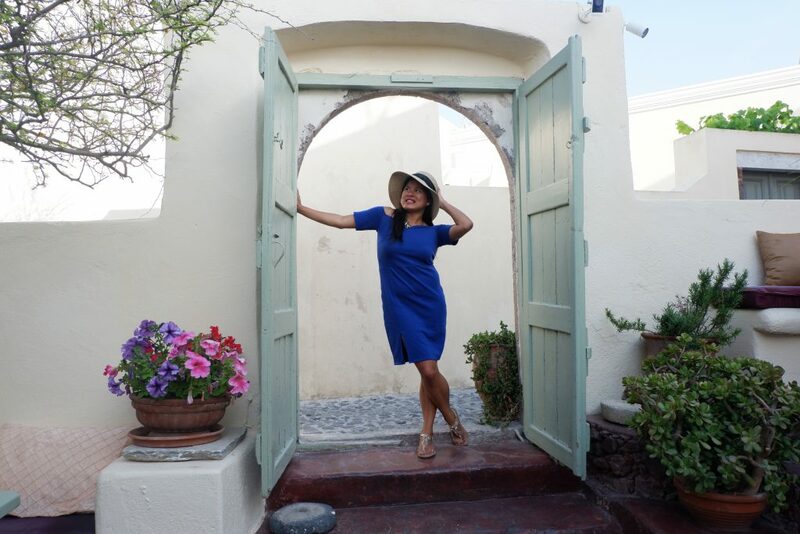 There are many things to see in Oia, and the whole of Santorini. But you have to take time off to eat, too. 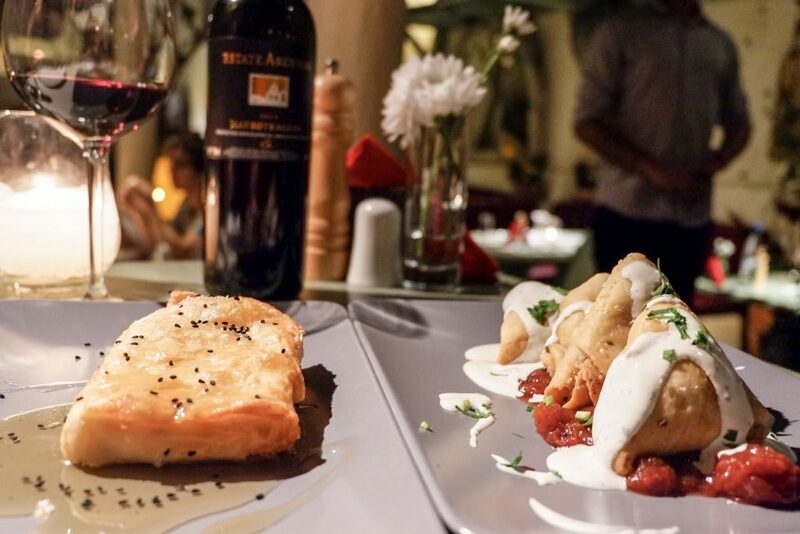 Thankfully, there are places like Karma that lets you continue your sightseeing even in the middle of a meal, while delighting you with perfect examples of great Greek cuisine.